Hello and WELCOME, my stamping friends! I stamped this cute little puppy with Memento Tuxedo Black Ink and colored with Copic markers. You can find this sweet little fella as a part of the PK-1334 Howling Puppy stamp set from Peachy Keen Stamps. I used up some more of my scrap paper for the background and all of the card stock is from Stampin' Up!. Here's a closer shot that beautifully demonstrates the texture and color variation of the Tree Textures Clam shell from Katie Sue Designs. I also used the Flower Soft Glue, to adhere the sprinkles. It works SO well with the sprinkles!! 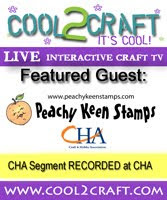 Your next stop on this hop, is at The Peachy Keen Stamps Blog, and it'll be the last. We're so happy to have you hopping along with us today!! Please leave us a comment there and let us know how the hop went for ya! Have a BEAUTIFUL DAY and HAPPY STAMPIN'!!! Nice job, that really looks like grass. SO SO CUTE Lorie! Your pup is colored beautifully and the FS grass looks awesome! Beautiful card! So sweet! Love the lil puppy! So cute!!!! Love the FS under the pup. Awww, poor puppy is sad... Love the grass...so soft! What an adorable doggie and I like your use of flower soft. This is gorgeous Lorie!! I love how he is sitting on that patch of grass!! Love this Lorie! The "grass" is perfect to ground the adorable doggy. This is colored beautifully and I love the way you did your grass! The three colors makes it look so realistic! Such sweetness! As always, I am blown away by your beautiful coloring skills. Love the layout of your card and the Flower Soft is such a fun touch to this beautiful card. animals on cards make them cheerful, no matter the occasion. I just adore your puppy dog! This had to be one of my fav sets! Great card. Love the papers and the lil doggie. WOWZERS Lori!!! This card is the CUTEST EVER!!!! Love your gorgeous coloring of the PKS and the flower soft....such a perfect touch!!! Wow, love that moss like texture. Great card and it looks like real grass. I love the stamp and the dog is so adorable! Makes me wanna go buy the dog stamps!! What a beautiful little puppy and the grass you added is so cute. love your card!! tooooo cute!! This is absolutely gorgeous, Lorie! Your coloring is stunning and I love the color palette you used on this card. :) So sweet! Your card is adorable, but it almost has to be with that cute puppy on it! The "grass" is a great touch, makes him pop. Do I detect a bit of Glossy Accents on the pads of his feet? Awwww...I always just want to give him a hug!!! so cute. Love that patch of grass too!!! Oh how cute! I just want to hug that little pup! What an adorable pup card you crafted for the hop! I can feel his sadness over missing his owner/friend! Love how you used the green for his soft resting place! Thank you for sharing with us hoppers! what a cute card! your coloring is flawless!